Scientists are loathe to use words such as ‘breakthrough’, but all evidence points to a small Cape Town company having recently lifted the lid on a revolution in biotechnology. The scientists at Quorus Biotech, who have their laboratory and office in Mowbray, have spent over ten years perfecting their game-changing bioreactor and bioprocess solutions which were finally made public on 11 December. What the Quorus team have created is a novel bioreactor that mimics the natural environment for the growth of bacteria and fungi from which secondary metabolites are harvested in order to produce products such as antibiotics, anti-inflammatories, anti-cancer drugs and vitamins. Their invention is multiple times more efficient, productive and cost effective than the traditional bioreactor technology that has remained largely unchanged for decades and can, in the realm of biotechnology, probably be equated with replacing the fax machine with email. Bioreactors are an essential component in every biotechnological process but up until now, in order to cultivate a microbe in order to obtain the desired secondary metabolites, it has been placed in a vessel containing the required liquid nutrient and continually agitated to ensure equal distribution of the nutrients. Not only does this continual stirring (a high-shear environment) stress the microbe, inhibiting its growth and subsequent production of the desired metabolites, it also means the product, microbial biofilm and nutrients it requires are mixed together in a biological soup, which makes product purification difficult and more costly. Additionally, in order to be grown in a high-shear environment, many microbes and other shear-sensitive production strains require extensive adaptation or genetic engineering. This is not only time-consuming and costly, it may not be successful, limiting the production of secondary metabolites to about one percent of known microbes. The range of bioreactors developed by Quorus removes these limitations and were developed from what the late Dr Winston Leukes proposed in his PhD thesis at Rhodes University in the late ’90s, which was that the nutrients could be supplied in a porous ‘straw’ which would allow the micro-organism to grow on the outside of the ‘straw’, which is housed in a manifold so that the production of high-value, low-volume secondary metabolites could be tapped off. Not only did this do away with the biological soup, resulting in improved product purity, it solved the problem of the high-shear environment. Leukes continued to work on this idea after university, developing the first prototypes in the early 2000s, having formed the company Synexa Life Sciences, with laboratories in Bellville. Leukes died unexpectedly in February 2006 at the age of 35 and after subsequent management difficulties as a result of restructuring, the Quorus team took Leukes’ legacy and in 2011 created Quorus Biotech as a separate company, receiving R13m funding from the Industrial Development Corporation to further develop and commercialise the bioreactor. The years since have been spent testing and fine tuning the technology, filing patents, publishing results in peer-review journals and designing the bioreactor to be a commercial unit that can be easily shipped and set up in any laboratory in the world. Dr Wade Edwards, COO at Quorus Biotech, described the technology they revealed on 11 December as “a system for growing bacteria, fungi, even mammalian cells in an environment that mimics the natural environment as opposed to what was essentially a bucket with a propeller in it”. Considering that the cultivation of microbial biofilms (which is what is grown on the outside of the porous ‘straw’ conceived by Leukes) is used in drug discovery, drug testing, bioprocess research and development and biomanufacturing, their novel biomimetic bioreactors, which are up to 30 times more efficient than traditional technology, are likely to increase discovery rates in laboratories that adopt the technology. 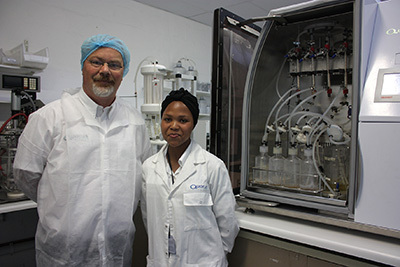 Research and Development manager at Onderstepoort Biological Products, Boet Weyers, said they are currently using the Quorus biomimetic bioreactor to test its application for the growth of bovine and ovine pathogens in order to harvest proteins to be used in producing veterinary vaccines. Commenting on the possibilities of the new biotechnology, Weyers said the ability to upscale production and improve the process was “very limited” when it came to traditional systems.